As a daycare centre company in the Metro Vancouver region, we’ve seen a lot of kids go through our childcare and early learning programs. Some children are quiet, some are loud, some are active and some are timid and shy – no matter what the age. However, regardless of personality, all kids need to learn some basic life skills to get them through to the next stages of their life. This includes learning to maintain their attention span, which is believed to help with improved problem solving skills. While this subject can often be associated with attention deficit hyperactivity disorder (ADHD), it actually covers a broad spectrum of children. Teaching young children to focus is not limited to those with ADHD. Let’s delve into some lessons on how to maintain attention span in young children. 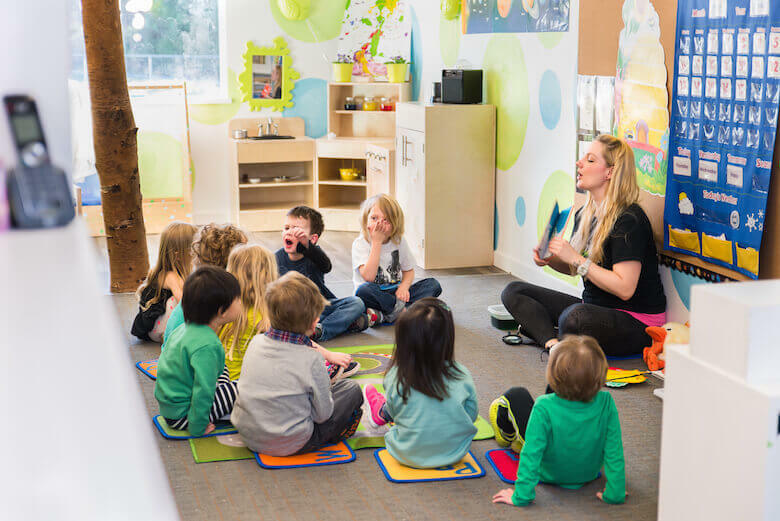 These are tips we’ve learned from running a successful daycare in Langley, Coquitlam and now, North Vancouver, over the years. In fact, most kids are normal if they don’t pay attention past a certain period of time. It’s part of growing up. No one expects a toddler to sit down and read a novel for three hours. Toddler Attention Span: How Long Should They Be Able to Focus? This brings us to our next points. Remove distractions if you don’t want kids to be distracted! Distractions here can be a myriad of things. This is also brought about in the Parents.com article linked to above. Also, as this article points out, for a child who has trouble focusing, lots of things can be a distraction that you may not realize – even the clothes they’re wearing. So this is where helping kids stay focused comes into play. If you want a child to complete a task, make it easy for them. If it’s reading a book, make sure it’s quiet. If they need to finish eating, turn off the TV. If they need to listen a long time but are fidgety, it’s ok! There are toys meant for fidgeters to help them stay on task. Also note here that an attention-grabbing solution for one child may not be a solution for another. Make sure you pick up on the queues the child gives you on what helps them concentrate. Some babies, for example, may be able to eat better if they are allowed to hold on to a single toy. Some kids like sleeping with a noise maker, and others only when its quiet. It all depends on what your unique situation is. Remember – context matters when it comes to maintaining attention spans in young children. When you do find out what works for maintaining attention in certain situations, use that to formulate combinations of task-and-fun. The Parents.com article linked to above gives the example of drawing letters with various materials, instead of just asking a child to memorize them. If a kid likes art, it’s more plausible they’ll enjoy learning to read and write if art is involved, and so on. According to this ehow article, there are activities that kids can do to practice paying attention. The idea here is that practice makes perfect. Kids may need to develop the skills of memory or noticing the details. This might help them later, when it comes time to really focus – when they’re not always inclined to do so. On this note, practicing doesn’t have to be with boring activities. As many will agree, making things fun for kids, and keeping them engaged, is what helps them stay focused too. This may mean some creativity on your part. A game of eye-spy can help kids learn to pay attention to detail better than finding Waldo in a book, if they like to glance around. This is an important one. According to the Parents.com article linked to above, if you as a child caregiver can’t learn to focus and calm down, how can we, as the adults, expect kids to do so too? Helping a kid increase attention span by paying attention to them is also brought out as a step in this article. And, if you are not doing well with your concentration abilities, it’s likely to affect your toddler’s attention span too, according to this research study. Making eye contact is important, as is speaking face-to-face with a child when asking them to do something. In a group setting, this may not work for every individual child, but it does make a difference for a caregiver to be paying attention to the kids, is what we’re saying here. It has been studied and indicated that exercise can be correlated to better ability to focus. To improve attention span in kids, give them plenty of play time! Running around, releasing all that energy may actually be good for their attention span when it’s needed. So don’t worry too much about kids having their ‘rowdy’ times of the day! Instead of letting it bottle up, put it in the schedule, so you can grab their focus more often. This is why school programs need recess and playtime. This one should be obvious, as it works on us adults too! If a child has something to look forward to for completing a task, it may help them achieve it. The downside of this approach, however, may be that a child expects a reward for everything they’re asked to do. So use this one with caution and intuition. If you are feeling like maintaining attention span in your toddler or preschooler is becoming a problem, fear not. It may be that this is just a skill your child needs to develop. It’s not usually a ‘gift’ that children are born with! Use the strategies above to see if you notice improvement. And if you really suspect something is out of control with regards to a child’s attention span, don’t be afraid to discuss it with your doctor. Your childcare provider should also be able to give you clues as to how your child is behaving during your time away from them, if it helps.